The double horseshoe curve at Claypool, WV. Photo by Donald A. Kaiser, September 1954. Don Kaiser and Carl Walters were friends and railfanning buddies. They often spent a mid-1950s weekend photographing the railroad scene around Columbus. Holidays would find them roving further afield. Labor Day weekend 1954 was a chance to visit the Nicholas, Fayette & Greenbrier Railway (NF&G). The 143 mile long West Virginia railroad was jointly owned by the Chesapeake & Ohio (C&O) and New York Central (NYC) railroads. 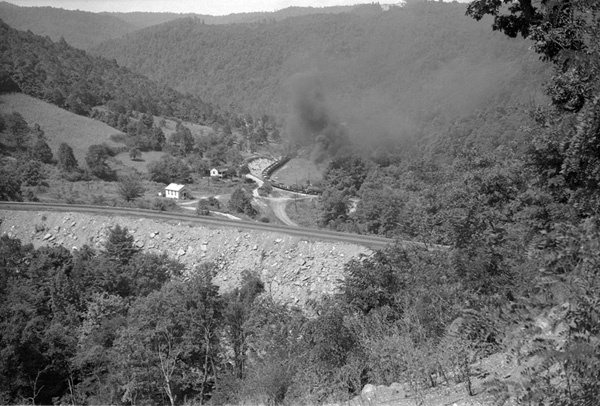 The NF&G served coal mines taping the New River coal field and also a large lumber operation – the Meadow Creek Lumber Co. The NF&G main line formed a half circle loop connecting to the C&O main at Gauley and Meadow Creek. The tail end of the old Toledo & Ohio Central (NYC) coming from Charleston connected to the NF&G at Swiss Jct. In steam days the center of the operation was Rainelle where the NF&G locomotive shops serviced both C&O and NYC locomotives. Rainelle was also where the mine runs were made up into longer coal trains. The NF&G was very photogenic with spectacular West Virginia scenery, tunnels and the Claypool loop - a double horseshoe. The C&O primarily used H-4 and H-6 class, 2-6-6-2 compound Mallet type locomotives. The 2-6-6-2 locomotives were especially suited to the curves and grades of the NF&G. The front steam engine of a mallet is not rigid with the locomotive frame but rather can swivel independently of the frame and rear steam engine. This allowed for ease of navigating the tight curves that follow the creeks along the narrow valleys leading to the coal mines. Photos suggest that typically the C&O used a pusher locomotive on their coal trains. For the mine runs having a locomotive on each end of the train was useful as there was no way to turn the train or even turn the locomotive. The NYC used class E2, 2-8-2 steam locomotives in 1954. Scant photographic evidence suggests the NYC double headed their coal trains. They did not have to contend with the Claypool horseshoe curves and grade. Donald A. Kaiser’s 1954 Labor Day weekend photos of the NF&G can be found by clicking here. More NF&G history can be found by clicking here.